Intriguing images are useful in capturing the attention; they could make a difference to whether or not a person takes an interest in what you have to say. Take the image below, seen in my local paper; you can imagine my surprise to find it sandwiched between a feature on the local Caledonian Association and the weekly crossword puzzle! The accompanying article, written by Dr Keith Souter, went on to introduce the reader to ‘Derbyshire Neck’. Cretinnen aus Steiermark 1819 gez. Loder, gest. Leopold Müller by Franz Sartori, (Publisher), Scan and post-processing by Hubertl – Oesterreichs Tibur. Licensed under Public domain via Wikimedia Commons. Reading on, I discovered that this large swelling within the neck, now commonly referred to as a goitre, was seemingly caused by a lack of iodine in both the soil and water of Derbyshire in the 18th and 19th centuries. The diet of the (mainly working class) people of the county was therefore deficient and as a result ‘Derbyshire Neck’, as it was then known, was prevalent. 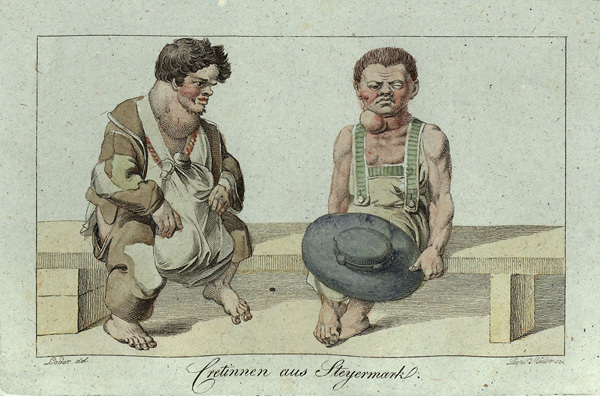 As Clinical Collections Coordinator at Wellcome Images, the sight of this image and the history it uncovered provoked me to delve into our picture library in order to search for more illustrations of the condition. Being Derbyshire born myself, I had been truly hooked in. 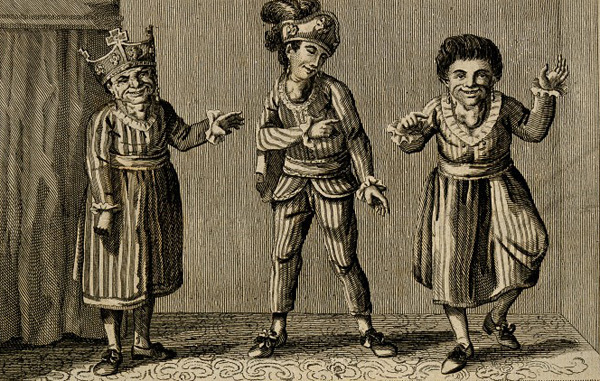 Three wild born people, all with goitre. Engraving, 1787. Wellcome Images reference no. V0007350. Within Wellcome Images, I found curious examples such as this engraving of Wild-born Human Beings where the goitres can be clearly seen. The Library collections also hold rare illustrations such as the red chalk drawing below of a man suffering the same condition by 17th century Spanish artist Jusepe de Ribera, just one of many of his works held by the Library. 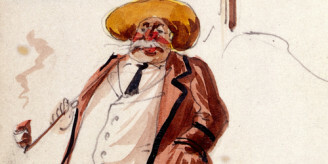 A man with goitre. 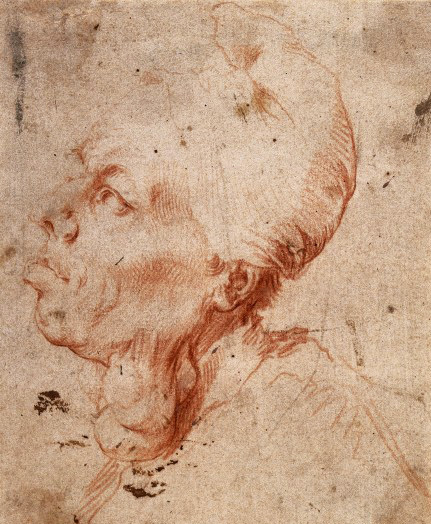 Red chalk drawing by or after J. Ribera. Wellcome Images reference no. V0010542. There are also many historical photographs in the collection, this photograph of a woman with a very large goitre came from St Bartholomew’s Hospital Photographic Society and was taken in 1897. It is among the earliest clinical photographs on record. Many early 19th century photographs like this were probably taken by either a trusted portrait photographer or the clinician themselves up until professional clinical photography departments emerged in London hospitals after World War II. 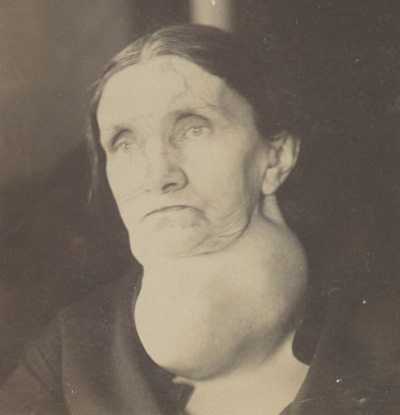 Photograph showing a large goitre in a woman aged 64 years, 21 Jan 1897. St Bartholomew’s Hospital Photographic Society. Image credit: St Bartholomew’s Hospital Archives & Museum. Wellcome Images reference no. L0062870. The Clinical Collection is one part of the Wellcome Images extensive picture library featuring clinical photographs and imaging, medical illustrations and digital art. Almost half of this collection is publicly searchable. The more sensitive images are available through a registration process. If you are a healthcare professional, student of medicine, clinical academic or health researcher, registering with Wellcome Images will allow you access to further clinical photographs each time you sign in and search. I undertook a survey this year of students and tutors at seven medical schools in England, which showed that 87% of those questioned found clinical photographs to be of use in teaching and learning. With its collection of over 35,000 images of clinical medicine, Wellcome Images could be a very valuable resource in both the study and practice of medicine. 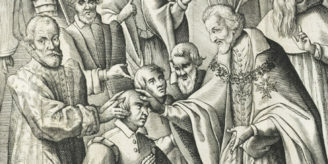 Author: Carly Dakin is Clinical Collections Coordinator for Wellcome Images.